UPDATE - Following a meeting of the Rijksmuseum board and our web report, the following statement was issued by the museum: "The Rijksmuseum will temporarily close its branch at Amsterdam Airport Schiphol. Construction work on the roof of the Holland Boulevard will take longer than anticipated. This was decided after a leak last week in which no works on display were effected. 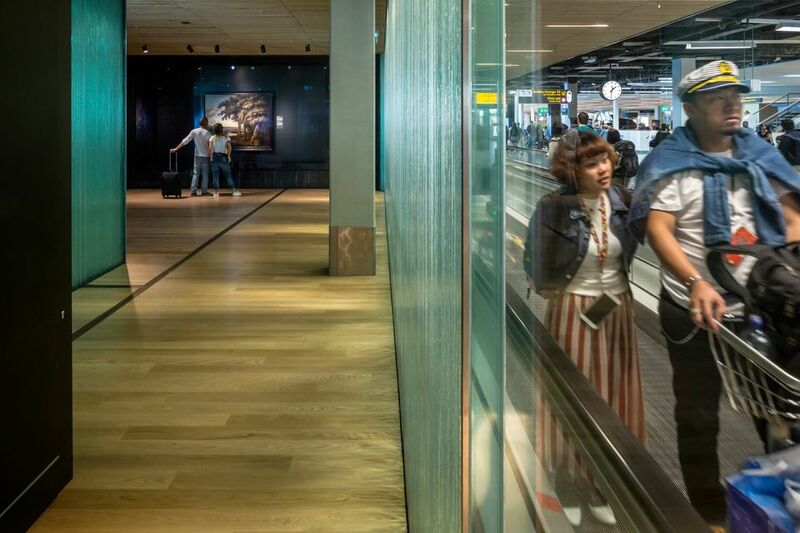 In consultation with Amsterdam Airport Schiphol, the Rijksmuseum has decided to temporarily remove the ten 17th-century paintings and tile picture until the works have been completed. They are expected to be returned on display this summer." The headline and standfirst have been altered to reflect this. A water leakage at the Rijksmuseum’s branch at Amsterdam’s Schiphol airport continued for nearly a week, initially dripping down a glass showcase with 17th-century Golden Age paintings. The Art Newspaper can report that water entered through the roof during building work. After a thorough initial investigation, museum staff did not return to the airport until yesterday, although the dripping was continuing. The water came in ‘‘quite heavily’’ to begin with, according to a museum spokeswoman. ‘‘It dripped down the outside of one of the four display cases, but not the inside,’’ she added. No pictures have been damaged, but the incident raises disturbing questions. In 2002, the Rijksmuseum opened the world’s first branch at an airport, to display a changing selection of original artworks and provide an income-generating shop. The Rijksmuseum Schiphol was renovated last year and reopened in September, with a selection of ten Golden Age paintings. The leak, which has gone unreported in the media, began in the evening of 15 January. There was a fault in the roof above a KLM departure lounge on the upper level, where renovation work is underway. Although the roof was fixed the following day, rain had penetrated into the floor of the lounge and continued to drip through the ceiling of the museum, which is beneath on the lower level. Museum staff were alerted in the evening of the incident, arriving at 11pm. A more detailed examination was conducted the next morning and the following day, with conservators deeming it safe to leave the pictures in their display cases. ‘‘This was based on risk assessments that the drips could not reach the paintings,’’ the spokeswoman said. Following their 17 January visit, museum staff did not return to the airport until yesterday [24 January]. During this period the museum relied on frequent checks by airport staff. 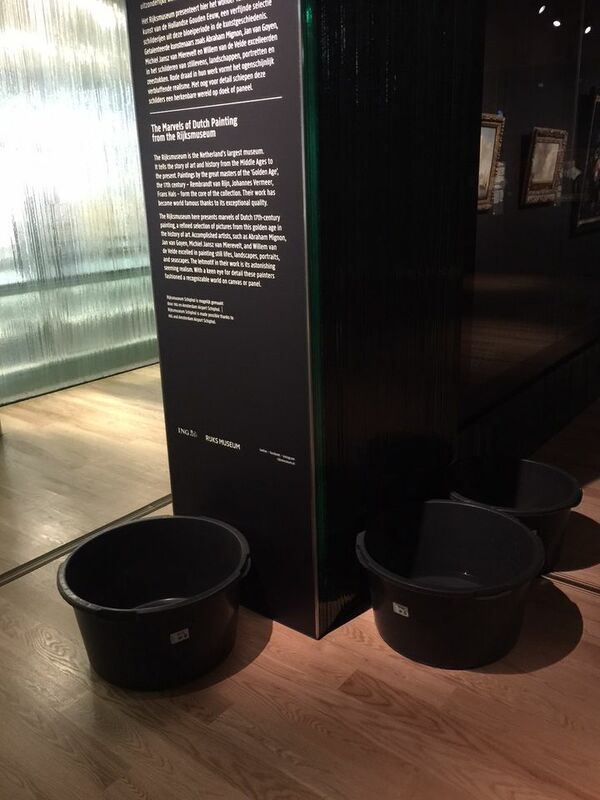 A museum spokeswoman admitted that showcases placed against a wall can ‘‘never be completely watertight’’, but on this occasion ‘‘there was no water dripping inside’’. Sensors placed inside the cases monitor humidity and these results are reported remotely to conservation staff. Dripping continued until last weekend. The water was caught in three large buckets, placed next to the vulnerable display case with five paintings: two panoramic landscapes by Jan van Goyen (1644), seascapes by Willem van de Velde (after 1670) and Ludolf Bakhuysen (1694) and a flower still life by Abraham Mignon (about 1670). The museum spokeswoman added: ‘‘We are seriously evaluating all aspects of the incident with Schiphol airport in order to prevent a recurrence. I cannot prejudge the outcome, but of course the safety of our collection is paramount’’. This afternoon [25 January] Schiphol airport is due to present a report on the incident to the board of the Rijksmuseum.